I've always loved the idea of small, easy to eat appetizers. It seems like there are a million different combinations that can be created using bread as a base. 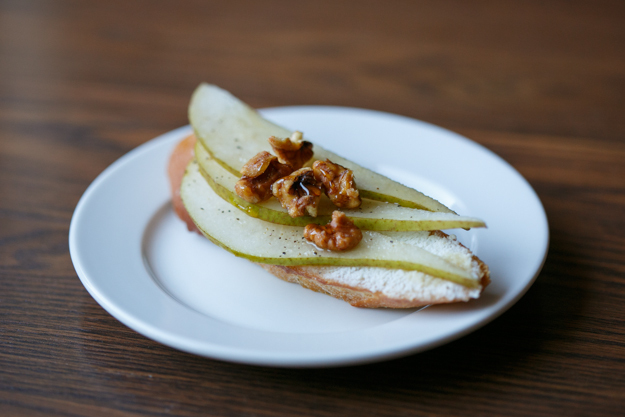 I recently saw this crostini recipe and really liked the idea of combining a typical pairing like bread and cheese with unexpected toppings like pear slices and walnuts. Ash and I frequently dine at Zpizza and I've ordered their pear and gorgonzola salad many times, so this recipe was right up my alley. It's not only tasty, but elegant looking as well so you're sure to impress your guests should you decide to serve it at your next party.